Carla Sinclair is a writer, graphic artist and webmaster. She writes articles primarily about attractions and theme parks. Her features are most often published on OrlandoTouristTips.com where thousands of tourists have enjoyed her insider tips while vacationing in the Central Florida area. She loves God, family, wolf dogs and coffee...lots of coffee. 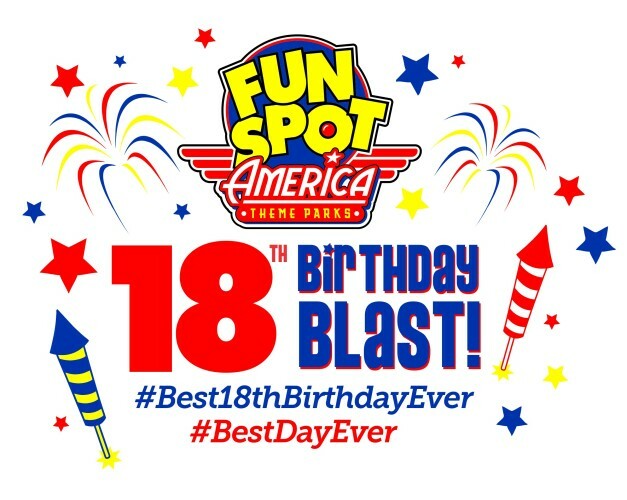 Fun Spot’s Birthday Blast will be on June 11th. It will be their 18th one! Finally “legal.” On this day you can purchase tickets for only $18. Nothing like someone else having the birthday, but you get the gift! Fun Spot’s Birthday single-day passes will be available online starting at midnight through 2:00 p.m. EST. If you are at the park, they will be sold from 10:00 a.m. to 2:00 p.m. These passes will not expire for an entire year, so you can have fun for less whenever you want! For $18 you will receive a single day pass that includes all of the rides and Gator Spot (only at the Orlando’s location). The SkyCoaster ride and arcade will require additional expenses, but hey, you’re already saving money. ORLANDO TOURIST TIP: If you have another $18 to spend, check out the photo deal while you’re at the Orlando attraction. The Fun Spot’s Birthday photo deal includes a 4” x 6” photo and 4 wallet-sized photos. Key chains with your photo can be made for an additional $1.99 each. These make excellent souvenirs and help preserve your Orlando vacation. If you will be attending Fun Spot’s Birthday Blast on June 11th, enjoy the party. There will be entertainment, music, giveaways and more. This Orlando attraction can easily fill the better part of an entire day. Children really love it. Fun Spot Orlando is located at 5700 Fun Spot Way, Orlando, FL 32819; phone: 407-363-3867. The Kissimmee Fun Spot is located at 2850 Florida Plaza Blvd., Kissimmee FL 34746; phone: 407-397-2509. Both locations offer a lot of fun, however, the Orlando location is still our recommendation (if you have the option of either attraction). ORLANDO TOURIST TIP: If lodging near or on International Drive, be sure to check out the I-drive trolley as a way to get to Fun Spot. The trolley is one of the best ways to get around this busy tourist area. For just a few dollars, it is a great way to have fun for less – money and hassle! Epcot International Flower & Garden Festival begins this year on March 2 and runs for 90 days, ending May 30, 2016. This is the longest timeframe yet for this Orlando theme park special event. Last year’s festival lasted 75 days. If you have a pass which allows entrance into Epcot year-round, this is a nice event to plan around. However, most tourists make their plans and then find out they’ll be attending this theme park during the festival (an extra bonus). Either way, you’ll appreciate this complete guide to the Epcot International Flower & Garden Festival and find some great tips. This year the Epcot International Flower & Garden Festival will feature 13 Outdoor Kitchens with two brand new ones – La Isla Fresca and Cider House. Each kitchen offers a small sampler dish (at an additional cost) with cuisine from that region of the world. It can cost hundreds of dollars to taste a sample from each kitchen, so be sure to read the following and pick out the dish you want to try to help stay within your budget. Most dishes will cost between $5-$10. Bauernmarket: Farmer’s Market – NEW! Next to the Germany Pavilion. Ice cold brews and an “organic” champagne apértif with elderflower and mint—a refreshing pick-me-up that’s ideal for spring. Guten tag! Near the United Kingdom Pavilion. Try a variety of buzz-worthy ciders and artisanal provisions that may inspire a playful picnic . France Pavilion. Try the colossal raspberry and fudge macaron—it’s waiting for you to relish and share! Between the Morocco and France Pavilions. Sweet and tangy creations made from locally grown fixings. Pair your picks with an adult thirst-quencher—wine, craft beer or a sweet watermelon juice or slush. Japan Pavilion. Innovative plates like the festival-favorite Frushi—fresh fruit with raspberry coconut rice, toasted coconut and whipped cream—are a hit with kids and adults alike. La Isla Fresca – NEW! Showcase Plaza. Caribbean-inspired fare seasoned with jerk-spice or carefully braised. Enhance this tropical tasting with a frozen drink or dessert. Mexico Pavilion. Let your appetite build as you explore a medley of tantalizing tapas and exotic elixirs, each boasting a hint of botanical flavors. China Pavilion. The tranquil courtyard is the ideal spot to sink your teeth into small plates of contemporary Chinese food and sip fruity bubble tea with your little ones. Showcase Plaza. There are plenty of tart and tangy items to try—including pineapple-flavored soft-serve, frozen lemonade and the popular spicy hot dog topped with chutney. Italian Old Country dishes like the new egg pasta stuffed with ricotta, spinach and spring veggies. Morocco Pavilion. Choose from a trio of spice-infused Mediterranean masterpieces and cocktails such as white sangria or sparkling wine with a pop of pomegranate liqueur. American Adventure Pavilion. Slow-cooked specialties—the perfect fixin’s for a springtime gathering with family and friends. Think lip-smacking sliders, brisket, smoked ribs and a mighty fine selection of golden craft brews. Showcase Plaza. Delve into a vivid spread of healthy and all-natural food and drinks presented on stylish, eco-friendly serving ware. This stop provides a bounty of inventive tips for growing your own groceries at home. If you are attending Epcot on a Friday, Saturday or Sunday, you can catch a great concert for free! 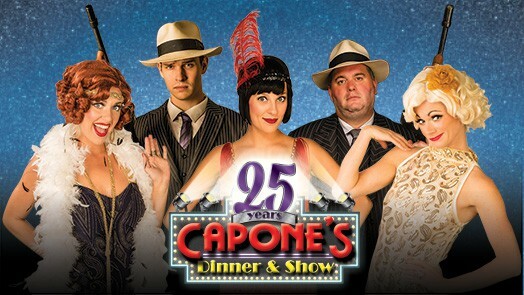 Performances are held at the America Gardens Theatre (between Japan & Italy) at 5:30, 6:45, and 8 p.m. and are included with park admission. The concerts are only 30 minutes in length, so if you miss the earlier one, return for another performance a little later. Several of these groups return each year. New acts are noted as NEW! April 15-17 – Blood, Sweat & Tears featuring Bo Bice “Spinning Wheel” – NEW! 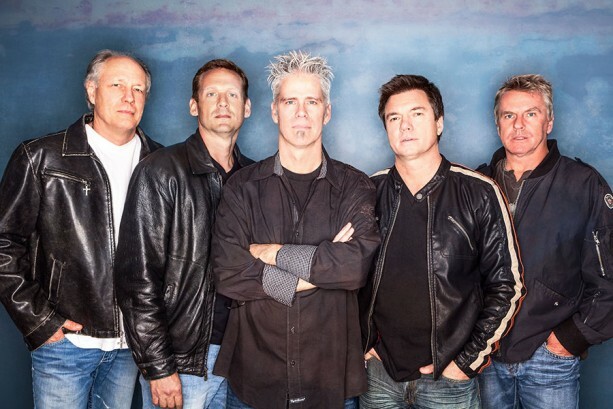 April 22-24 – BRIAN HOWE, former lead singer of Bad Company “Can’t Get Enough” – NEW! April 29-May 1 – Georgia Satellites “Keep Your Hands to Yourself” – NEW! May 13-15 – Darlene Love “Wait ‘Til My Bobby Gets Home”– NEW! From 10:00 a.m. to 5:00 p.m. on the weekends, you’ll discover many special seminars and presentations scheduled during the Epcot International Flower & Garden Festival. Be sure to attend a how-to demonstration at the Festival Center and get some great advice for your own garden! Garden Information Desk – Ask questions of Master Gardeners from the Institute of Food and Agricultural Science (IFAS) at the University of Florida. Spotlight Stage – Planting tips from the Institute of Food and Agricultural Science (IFAS) at the University of Florida. Festival Center Shop – Flower & Garden Festival-themed merchandise and more. View nature through the eyes of “Plein Air” artists and appreciate one-of-a-kind Disney works of art on display within the World Showcase from 11:00 a.m. to 7:00 p.m. Reap the benefits of sharing quality time together at select Festival gardens. As a bonus, animal specialists from Disney’s Animal Kingdom will be presenting an exhibit on how bugs play an important role in helping a garden thrive. Check it out at the Festival Center from 10:00 a.m. to 5:00 p.m. Celebrate the place we call home, where you can enjoy interactive activities, discoveries and more! Plus learn about the efforts to protect coral reefs and other marine life at The Seas with Nemo & Friends®―a special tribute to the amazing creatures that dwell in our vast oceans. Explore the bounty of the Sunshine State from Apalachicola to Zellwood at this Festival Center-based event. Marvel at amazing flora designs that defy description inside the Festival Center from 10:00 a.m. to 5:00 p.m.
located along the Test Track Walkway. Music Garden Melodies Playground – NEW! This garden features Disney’s “Fab Five” topiaries, including bandleader Mickey Mouse and his fellow members Minnie Mouse, Goofy, Pluto and Donald Duck. It is hands-on, and after dark it really lights up! Children can play instruments like drums, chimes and xylophones—and tap into their adventurous side by tackling state-of-the-art net climbers. Music-themed plants also add a clever touch to this sonic scene. Inspired by the Disney•Pixar film Cars, this playful area features a canopied jungle gym and eye-catching cacti. Topiary buddies Mater and Lightning McQueen invite parents to relax and recharge while your kids race around in a desert-themed mini park. ORLANDO TOURIST TIP: Enjoy an “I Spy” moment by taking turns pointing out the various auto parts scattered among colorful flower beds. Butterflies on the Go – Kids will have an opportunity to observe several species up-close, learn about their life cycles and may even witness them emerging from cocoons. Purple Martins – See an incredible species of small migratory songbirds that have undergone an impressive 3,000-mile journey from the Brazilian Amazon to raise their families at Walt Disney World Resort. Ranger Mickey and Friends – Pose for a family photo with this spectacular topiary and then find your closest neighborhood park with the help of the National Park Foundation and the National Park Service. Backyard Habitat – Unearth sources of inspiration to construct your own wildlife-friendly spaces at home. Nature Works Everywhere – Kids will absorb amazing tips on how to create gardens that will help their school yards filter water, provide welcoming habitats and improve soil quality. Bonsai Collection – ancient art producing amazing miniature trees. English Tea Garden – 20-minute guided tour (sign up) & self-guided tours. Floating Mini-Gardens – petite plots drifting on the ponds. Health & Healing Garden – discover ancient plants that have the ability to heal. Pepper Fire Garden – the world’s hottest peppers. 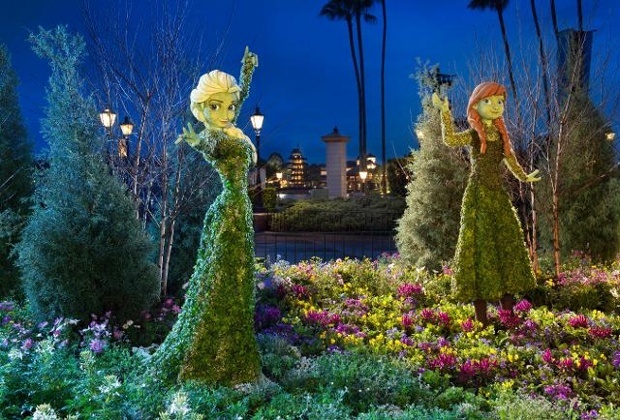 EPCOT® Gardens of the World Tour – designed especially for garden enthusiasts! Three-hour tour at an $ additional cost. Behind the Seeds Tour – Interact with amazing plants, insects and fish—and even see alligators. One-hour walking tour at an $ additional cost. ORLANDO TOURIST TIP: For Annual Passholders, be sure to pick up one of three special edition prints from Disney artist Don “Ducky” Williams. They are available (while supplies last) at Innoventions West behind Club Cool. You must show a photo ID and valid annual pass or MagicBand. One print per Passholder per month. Lighted Magical Accessories: Children will love attending at night if you purchase special accessories that light up as you travel around World Showcase. Choose from the Mickey Ear Hat, Minnie Mouse Headband, Mickey Mouse Glove and the Sorcerer Mickey Wand. As you can read in this complete guide to the Epcot International Flower & Garden Festival there is a lot going on during this featured event! It is one of the best times of the year to visit Epcot. Not only is the Orlando theme park extraordinarily beautiful, the flowers and gardens provide more things to see and do. Best of all, most of it is free! This year’s Holy Land Experience free day is scheduled for February 24, 2016. For one day out of the year, this Orlando theme park offers free admission into the park. They do this in order to qualify for property-tax exemption status as a religious entity under state law. This attraction is usually less crowded than other Orlando attractions, however, on this date it will be bustling with guests. ORLANDO TOURIST TIP: Plan to arrive when the park opens at 10:00 a.m. due to possible park closures once capacity of about 2,000 has been reached (and it usually does reach capacity on Holy Land Experience free day). Attending this park is such a unique way to experience the Bible. Not only the sights will take you over 7,000 miles away and over 2,000 years back in time, but the sounds and tastes will as well. There are shows, shopping and dining all within the theme park. The Holy Land Experience is open Tuesday through Saturday from 10:00 a.m. until 6:00 p.m., but is closed on Sunday and Monday. Holy Land Experience is also closed on New Year’s Day, Thanksgiving Day, and Christmas Day. If you’d like to attend a Sunday church service, a non-denominational Christian service is offered (Trinity Christian Center) at the Theater of Life (inside the Temple building) in the center of the park. The service begins at 10:30 a.m. ORLANDO TOURIST TIP: All ages are welcome, however, they do not offer a nursery or teen/youth group. If you will not be attending Holy Land Experience free day, ticket prices are $50 per adult, $35 per child (6-12) and $20 per pre-k child (3-5). If you want to see all of the shows and go through each experience thoroughly, you may want to consider a 2-day ticket ($75/$50/$35). This will allow you to see more of the theatrical presentations. ORLANDO TOURIST TIP: While all of the live entertainment is inspiring, be sure to catch “Passion of the Christ Live Drama.” It is a little lengthly, but very inspirational. 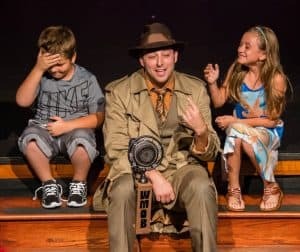 While adults may enjoy this Orlando attraction the most, there are plenty of fun things to do for kids. An entire section of the park is dedicated to youngsters called the Smile of a Child Adventure Land. In the future, a nine-hole miniature golf course will also be featured (completion date T.B.D.). Teenagers have their fun too at the JUCE Explodes Youth Center where at certain times throughout the day they can sing karaoke, participate in a praise dance-off and more. 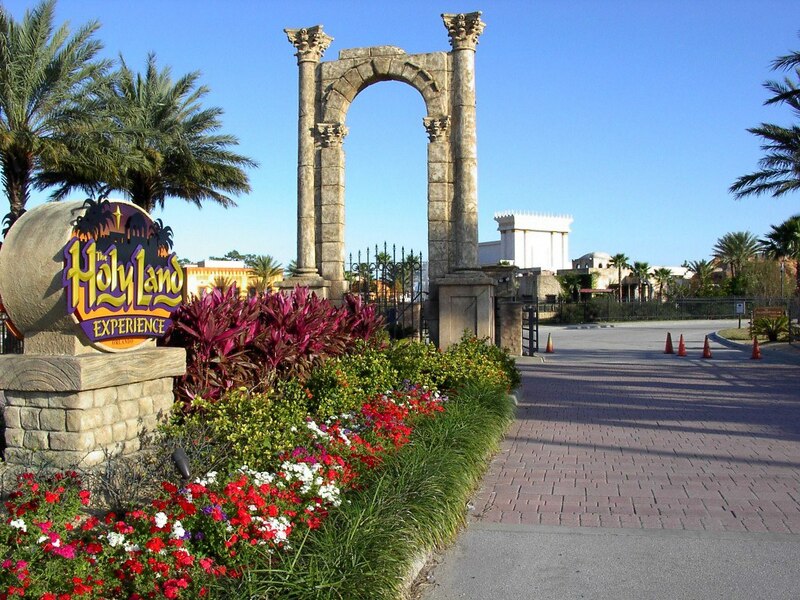 Enjoy the Holy Land Experience free day, located just off Interstate-4 at 4655 Vineland Road, Orlando, FL 32811. For more information call 407-872-2272, or go to holylandexperience.com. Since the day is free, why not consider a small donation while you are there? I’m sure you will feel blessed!